Throughout history the pattern has been the same: First an innovative design is introduced for a specific audience; then it's followed by reproductions--often unauthorized--that are marketed to everyone else. "Knockoffs are inevitable," says New York City-based lighting designer Lindsey Adelman. "It's not bad or good. It makes sense that people will see something and want it for themselves." It also makes sense that knockoff artists will try to profit from that desire. So, besides costly legal protection, how can designer-entrepreneurs avert imitators or, better yet, turn the knockoff challenge into opportunity? Sit tight: The Emeco Navy chair. 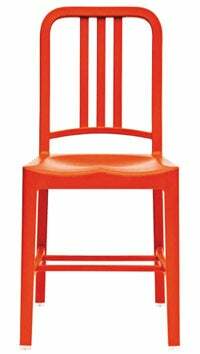 Emeco's aluminum Navy chair has become the poster child for this practice. The iconic design, manufactured via a rigorous 77-step process at the company's Hanover, Pa., factory, was developed in 1944 to provide indestructible seating for use on Navy vessels. Today it's sold at stores such as Design Within Reach for more than $450, a price that reflects the painstaking domestic manufacturing process. The Navy chair's industrial-chic looks, meaningful heritage and lightness combined with strength make it popular among interior designers, who have placed it in such stylish settings as Armani boutiques and New York's Royalton Hotel. But it's also a hit among knockoff artists, who sell much lower-priced versions made cheaply overseas. Emeco CEO Gregg Buchbinder is vigilant about policing his star product. His latest legal target is Restoration Hardware, whose "Naval" chair was removed from stores and catalogs after Emeco filed suit last October. The cost of legal protection and action is high, but to Buchbinder--who has taken on the role of crusader in the knockoff wars--part of the return on investment is educating the public. Newspaper articles and blog posts about the Restoration Hardware suit let Emeco customers know exactly what they're paying for--high quality, domestic jobs, a sustainable product, a lifetime guarantee--when they lay down the money for a genuine Navy chair. But Buchbinder did more than take on the knockoffs in court. He realized there was a legitimate demand for a lower-priced chair that he could capitalize on, so in 2010 Emeco launched a $260 version of its Navy chair, made from upcycled plastic soda bottles and manufactured using a less expensive injection-molding process. "It was a way to capture our heritage and share the Navy chair with people in a lower-cost way," he says. Providing the object of desire at a lower price also proved to be a lucrative way to forestall imitators. 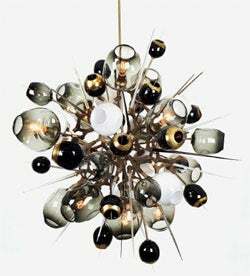 The real deal: designer Lindsey Adelman's original "Boom Boom Burst" light fixture. Lighting designer Adelman's spidery chandeliers, handcrafted at her Manhattan studio by a 15-person team, sell for thousands of dollars. As many as three machine shops and seven artisans might have a hand in a single piece before it reaches the assembly stage, which takes one full day per lighting fixture. The team spends as much time on creative work--design and prototyping--as it does on assembly. Adelman knew her designs were inspiring lower-priced, lower-quality variations, but she wasn't interested in making cheaper versions of her own product. "I truly focus on what's going to bring value to my business and studio as far as quality of life," she says. "Offering a lower-cost line wouldn't improve our quality of life at the studio." Instead she decided to thwart knockoff artists--and foster a culture of making--by providing guerrilla DIYers with the tools to create their own pieces. She posted "You Make It" instructions on her website detailing how to construct Adelman-style chandeliers using standard parts available on Amazon. The move has had the indirect benefit of boosting fan loyalty and brand authenticity, as well as helping the designer step up her own game. "Knockoffs are a catalyst to continue to develop new work," she says. "It gives me motivation to stay one step ahead and to work at a higher skill level." A Girls Can Tell tea towel and lunch bag (below). 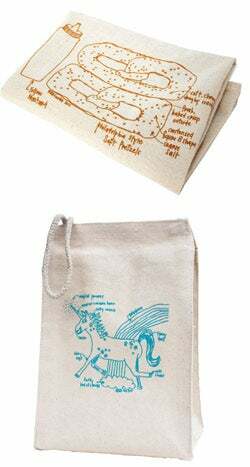 Designer Sara Selepouchin founded Girls Can Tell, which sells tea towels, lunch bags and coasters adorned with her signature diagram illustrations for $14 to $40. She has seen copies of her products in the marketplace--including one by a kitchen-goods behemoth whose representatives had visited her booth at a trade show. "A lot of people have one thing they're known for, so it's particularly devastating when that one thing is knocked off," she says. For Selepouchin, who has been alerted to imitators by friends and fans, the uniqueness of her aesthetic serves as ammunition. "If you really have an authentic look and feel, you're doing that much of a favor to yourself," she says. "Your brand will protect itself." She is also very protective of where she sources her materials. "That makes it a lot harder for people to really knock off what I'm making," she points out. Marc Misthal, a partner at Gottlieb, Rackman & Reisman, a New York firm specializing in intellectual property law, agrees. "It's going to be easier to legally protect something that people look at and say, 'That's a whomever design.'" He suggests going a step further by securing exclusivity with suppliers for materials. Josh Owen, who runs his eponymous design studio in New York and chairs the Industrial Design Department at Rochester Institute of Technology, says one key to defending designs against copycats is being first in the marketplace. New mechanisms--such as membership-based prototype facilities, crowdsourced manufacturing and the ability to sell directly through one's own website--allow nascent designers to get up and running faster than ever before. "It's still not a perfect system," Owen says, "but designers are more empowered now." Most of all, he warns his students, "Don't hold your ideas so close that you become a paranoid troglodyte hiding in your basement holding onto these ideas. You have to strike a balance between being a steward of your ideas and finding partners who can help protect them." The options for legally protecting a design are complex, especially with changes to patent laws scheduled for this year. It is best to consult with an attorney to figure out the most cost-effective methods. "It's better to invest the money upfront and get the protection," says lawyer Marc Misthal of Gottlieb, Rackman & Reisman, "because it's often costlier to compete with and chase down knockoffs." Here are various levels of protection available to designers. And one last piece of advice from Misthal: When licensing your work, make sure you try to maintain ownership of the rights (as opposed to handing them over to the person who's manufacturing and distributing your design). Copyright protects artistic expression (i.e., not the idea itself, but the way it is expressed). A painting, movie, song or piece of writing can be copyrighted, but a functional item like a chair cannot. However, if the chair's form is unusual enough to qualify as sculpture, or if it features handcrafted scrollwork or other artistic elements, it might be eligible for copyright protection. The U.S. Copyright Office charges a $35 electronic filing fee; once granted, the copyright lasts for the life of the creator plus 70 years. Trademarks identify the product's source. A trademark protects any identifying feature (e.g., a product name, logo or signifier, such as Burberry plaid or the red soles on a pair of Christian Louboutin shoes). The government charges $275 to $375 per claim, and the acquisition process can take several years. Trademarks last forever. A utility patent protects a mechanical innovation (e.g., a new way to fold a chair). In legal terms this mechanism must be "novel" and "nonobvious," meaning that in the eyes of the U.S. Patent and Trademark Office examiner, even someone skilled in that area would not have thought of it. This is the most expensive protection to obtain--about $7,000 to $10,000--and takes on average three to seven years to secure. It lasts 20 years. A design patent protects the look of a product (anything from handbags to furniture).